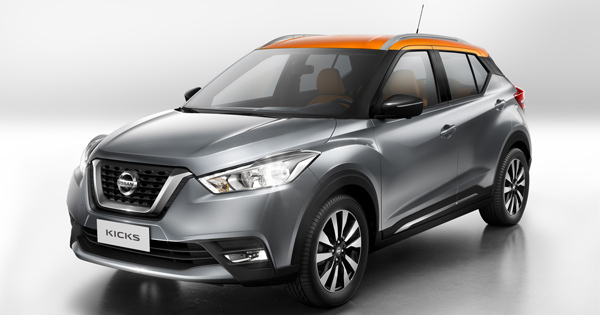 The venues may change, but only one winner seems to emerge in each race. Nico Rosberg widens his lead, while the frustration of those who want to usurp him, including his teammate Lewis Hamilton, continues to grow. 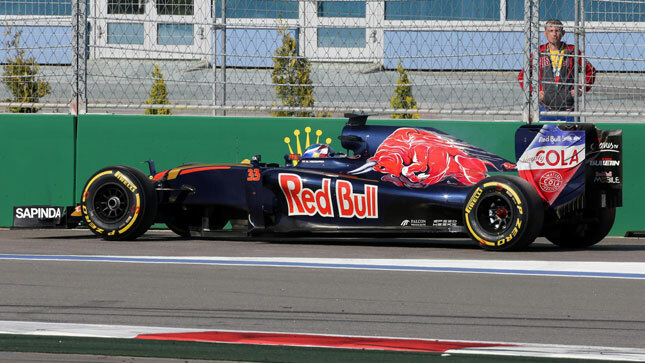 Here are the highlights from the Russian Grand Prix. 1. 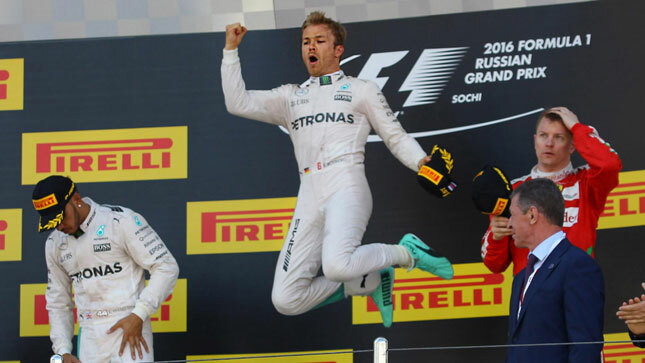 Nico Rosberg now leads the championship by 43 points. The championship leader enjoyed another untroubled race in Russia, converting pole position into victory once again after cruising away from his main rivals. It’s the German’s seventh consecutive race win, a feat only Alberto Ascari, Michael Schumacher and Sebastian Vettel have achieved before in the entire history of the sport. The gap in the standings to second-placed Lewis Hamilton now stands at 43 points, a commanding lead which the German has built up just four races into the new season. Granted there are 17 grands prix still to go in the race to the title, but even at this early stage Hamilton is going to need a lot of luck to overturn such a large deficit. 2. Mercedes chartered a plane to fix Hamilton's car. 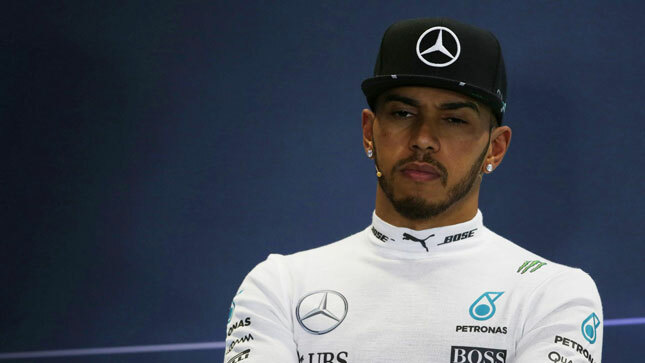 For the second time in as many races, Lewis Hamilton was hit by an engine failure during qualifying, leaving him unable to challenge for a place at the front row. The three-time world champion admitted a fortnight ago that he had no “more jokers available” with regard to the battle with his teammate, but before the race had even begun he was forced into damage limitation mode as a mechanical problem left him 10th on the grid. Mercedes was so determined to make up for the issues on Hamilton’s car that it scrambled a plane from the UK to Russia overnight, allowing it to fit spare parts and avoid a grid penalty before lights out. 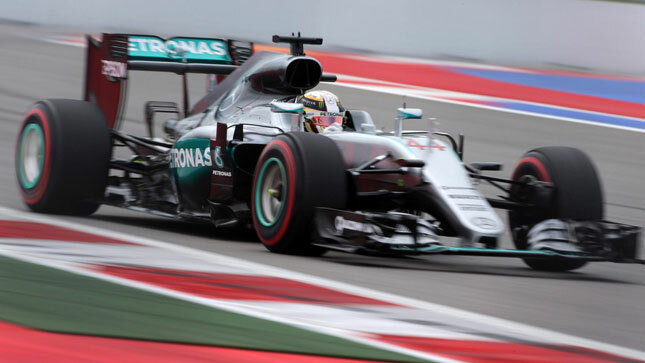 Fortunately for Hamilton, a sluggish start kept him out of harm’s way with collisions up ahead on the first lap, and the 31-year-old found himself running in third place just eight laps in. From there, he was able to pass Valtteri Bottas to take second, although a water leak forced him to back off in the latter stages when he looked quick enough to reel in his teammate. 3. Hamilton got another reprimand. As if his weekend hadn’t gone badly enough already, Hamilton was summoned to see the stewards after qualifying on Saturday following an incident in Q1. The British driver ran wide at Turn 2, but failed to rejoin the track in the correct place. As a result, he was given his second reprimand of the season, following an incident where he had illegally reversed in the pit lane in Bahrain. “When I was karting, there was one steward, he was just there to make everyone’s weekend a bad weekend,” Hamilton told Autosport. “I started to see signs of him!” The world champion will be given a 10-place grid penalty if he receives a third reprimand this year, something he now believes is inevitable. When it rains, it pours. 4. Sebastian Vettel will need to top up the swear jar. When the four-time world champion collided with teammate Kimi Raikkonen in China two weeks ago, Vettel was quick to blame Red Bull’s Daniil Kvyat, although he has since admitted that the Russian wasn’t at fault. However, there can be no doubting who was to blame for Vettel’s second retirement of the season as Kvyat hit him not once, but twice on the opening lap, forcing the Ferrari driver out of the race. Vettel was apoplectic on the team radio, and his post-crash message had to be censored with many bleeps in lieu of the barrage of swearing. While the stricken Ferrari was recovered, Vettel passed up on the customary moped ride back to the pits, instead opting to ride the scooter himself with a marshal clinging on behind. Now there’s a story for the grandkids. 5. Red Bull was nowhere. Daniel Ricciardo and Daniil Kvyat qualified sixth and eighth in Sochi, and both had hopes of climbing up the order after Vettel’s grid penalty for a gearbox change. However, Kvyat’s shunt with Vettel on the first lap had the added consequence of pushing the Ferrari into the path of Ricciardo, causing irreparable damage to the underfloor of the Australian’s car. Both emerged from the pits on medium compound tires--the hardest available to the teams this weekend--in the hope that they could make it to the end of the race without pitting again. However, the slower rubber left them as much as five seconds per lap off the pace of the leaders at one stage, meaning they both missed out on points for the first time this season. 6. Williams had its best race of 2016 (so far). 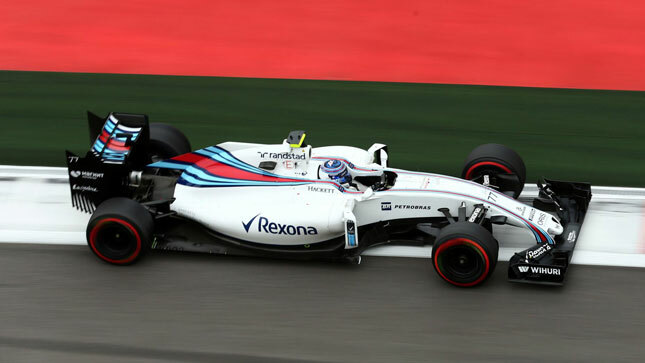 Williams has made an unremarkable start to the new season having slipped down the pecking order over the winter, but it produced its strongest performance of 2016 in Russia by taking fourth and fifth. Valtteri Bottas looked capable of getting on the podium after a first stint in which he held off both Hamilton and Raikkonen, but the pace of the Mercedes and the Ferrari eventually became too much to keep at bay. Just six points behind Red Bull in the constructors championship, Williams will be hopeful that its consistency will help it challenge for third again this season. 7. McLaren finally scored some decent points. Meanwhile, McLaren no longer has to suffer the ignominy of having its only world championship points scored by a reserve driver, as Fernando Alonso and Jenson Button both finished in the top 10. While Button managed to squeeze into the points at the expense of Ricciardo, Alonso fared much better as he capitalized on a terrific start to cross the line in sixth place. It’s McLaren’s highest finish since the Hungarian Grand Prix last year, when the Spaniard came home in fifth. 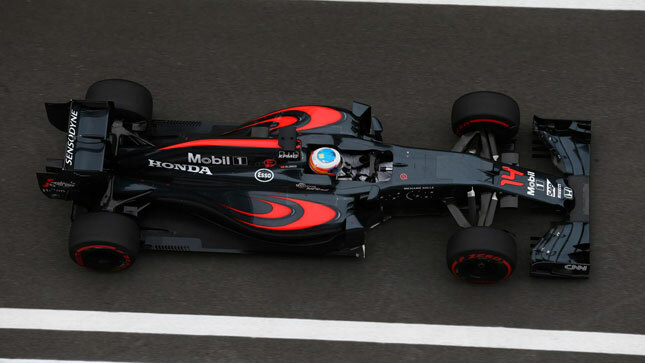 After the race, Alonso said the result was evidence of McLaren’s progress, and that the team should aim “to be in the points regularly” going forward. 8. Kevin Magnussen and Romain Grosjean produced for Renault and Haas. Just behind Alonso, Magnussen and Grosjean also delivered the goods as they finished seventh and eighth for Renault and Haas, respectively. 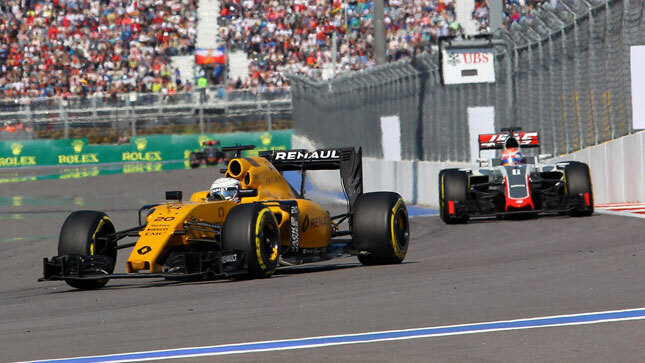 The six points that Magnussen earned in Russia are Renault’s first since its return as a full works team, and the performance will give it added motivation as its engine progresses through the course of the season. Grosjean, meanwhile, ensured that new entrant Haas scored points for the third time in four races, and the Frenchman will be doing no harm to his ambitions of driving for Ferrari should the Italian team drop Raikkonen for 2017. The former Lotus driver took a risk by switching to the American outfit; there’s no evidence yet to suggest the move isn’t advancing his cause. 9. Esteban Gutierrez caused a collision at the back. 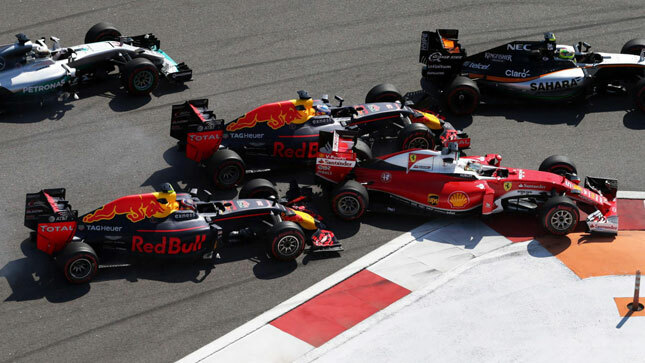 While all eyes were on the incident involving the Red Bulls and Vettel’s Ferrari, attention was drawn away from another coming-together at the rear of the pack in a chaotic first lap. Haas’s Gutierrez ran into the Force India of Nico Hulkenberg at Turn 1, which led to a contact between Manor’s Rio Haryanto and Sauber’s Marcus Ericsson in the same corner. 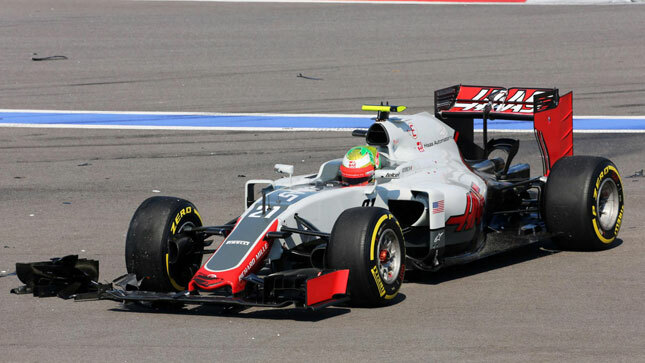 While Gutierrez and Ericsson were able to continue, it was a premature end to the race for the other two cars involved. Speaking after the race, the Mexican accepted that he was to blame and that he felt “very bad” for having damaged the races of other drivers. He is yet to score points this year, and will be desperate to do so at the next race in Spain given his teammate’s form in the other car. 10. Toro Rosso had a bad day. Red Bull’s sister team had been aiming for solid points having so far failed to live up to its preseason promise, but it left Sochi empty-handed after a series of unfortunate setbacks. 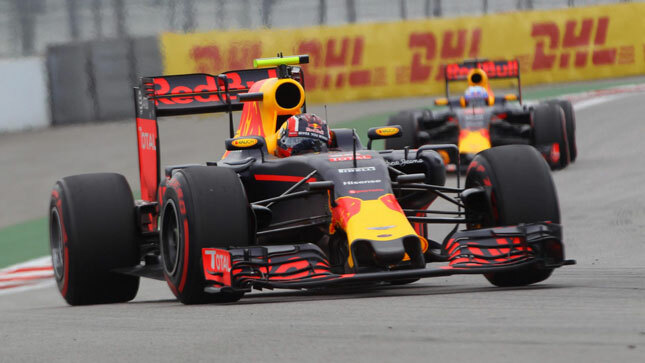 Max Verstappen looked set to capitalize on Ferrari's and Red Bull’s problems early in the race, but the Dutchman was forced to retire from sixth following an engine failure. That meant Toro Rosso had to rely on Carlos Sainz, but the Spaniard missed out on the top 10 after picking up debris in the opening stages before later receiving a 10-second penalty for a racing incident with Renault’s Jolyon Palmer. With a 2015 Ferrari engine powering the STR11s for the year, the team knew it would be crucial to make the most of its advantage early on in the season before rivals caught up. But having taken just 17 points from the first four grands prix, it will surely feel it has fallen short in that respect.